For security of heat energy and for economic purposes, investing in woodfuel boilers makes sense for some businesses, farms and large households. Feasibility studies and handling advice are available for those thinking of installing any of the variety of log, chip or pellet boilers that may be on the market. Support for non-domestic installations is available through the Renewable Heat Incentive, paid on the amount of heat produced. Clients may commission reports in which the heat requirement of their space will be calculated, leading to boiler size estimation. Expected annual fuel requirement will be worked out, and an assessment given of the current set up of existing buildings. Advice on general space requirements and potential investment for handling and storage of fuel will be given. Options for fuel supply or logistics for handling will be given, including the most economic approach. Client resources and inclinations vary widely. Some people or organisations may have an abundance of storage space, machinery, labour, and a hands-on approach. Others may not have time, resources, technical knowledge, or the inclination to be so involved. Such differences will be accounted for at the discussion stage and in the final report. 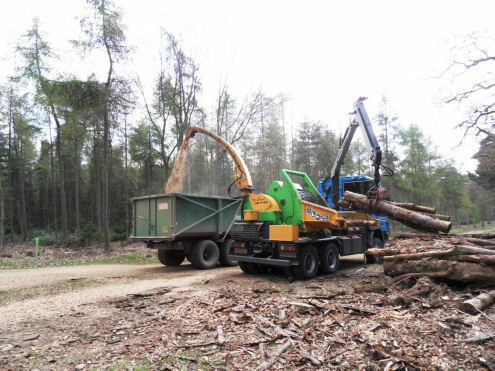 Contact The Forestry Office for woodfuel handling advice and feasibility studies.